The cortical regions of the renal lobules are fused to form the large cortical part of the renal lobes. Each lobule contains centrally an intralobular vein (v. intralobularis) which will drain blood to the cranial veins (vv. renales craniales) (in the cranial renal division) or to the caudal renal vein (v. renalis caudalis) (in the middle and caudal division). The cranial veins and caudal vein finally drain (through the v. iliaca communis) into the caudal v. cava (v. cava caudalis). Birds, as lower vertebrates (but in contrast to mammals), have a renal portal system (circulus venosus portalis) ventrally from each kidney, which passes venous blood from the legs and lower intestines into the kidney through the interlobular veins (vv interlobulares). 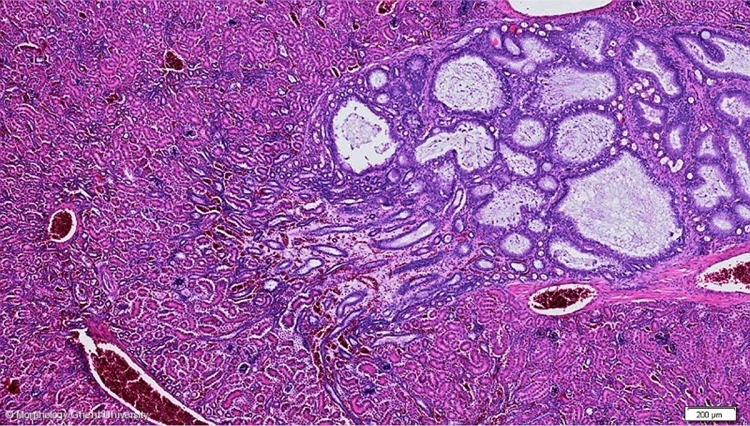 These interlobular veins surround the cortical part of each lobule, thus marking the border between two adjacent lobules and also run at the periphery of the medullary cones.